Impellus runs management training courses at more venues across the UK than any other management training company. 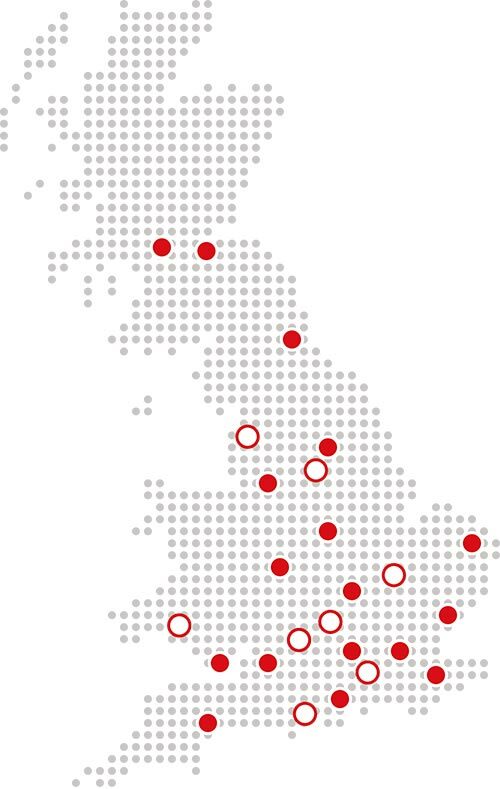 All of our training venues are easily accessible. Our central London venue is easy to get to by public transport, and all venues outside of London are by arterial roads and have free parking. Our venues are all hotels with outstanding facilities. We provide good quality refreshments throughout the day including an excellent two-course hot and/or cold lunch in the restaurant. The elegant, Victorian, 4-star Mercure Exeter Rougemont Hotel is in the heart of Exeter, opposite Exeter Central Rail Station, 5 miles from the M5. The hotel has limited car parking spaces, however there is ample alternative parking in the vicinity. Impellus will reimburse paid parking for the duration of the course. Five minutes’ walk from Norwich International Airport, Holiday Inn Norwich – North hotel is 15 minutes’ drive from the city centre, where Norwich station is served by direct trains to London. Off the junction of the M4 motorway and the A34 road, this low-rise hotel is 3 miles from the medieval Donnington Castle and 5 miles from Newbury Racecourse. Prested is just off Junction 24 of The A12, near Kelvedon and Feering. With stylish interiors, beautiful grounds and friendly accommodating staff, it remains unequalled in north Essex. Nestling in a 200-acre ancestral deer park, deep in the Garden of England, just off the A20. Tudor Park hotel is 1 mile from Bearsted train station, Maidstone East train station is 10 minute drive away. Located just off junction 33 of the M1, the hotel is only 2.5 miles from the Sheffield Arena and 3 miles from Meadow Hall shopping centre. Located 3 miles from the city centre, just beside the A34. The Hallmark Hotel Cambridge is in a great location right on the A14, just a mile from the M11 and 5 miles northeast from the heart of Cambridge. Overlooking a marina, this modern hotel is 2.4 miles from Liberty Stadium, home of Swansea City Football Club and Ospreys rugby team. It is also 5 miles from Mumbles Pier. Situated close to Guildford city centre and railway centre, the hotel is easily accessible to the A3 and M25. Situated close to the M55 and A6, this hotel is 4 miles from Preston bus station and 3.8 miles from Preston train station. A city centre location on the outskirts of the historic Old Town, this hotel is situated 2 miles from the bus station and 3 miles from the train station.